There is a new push to protect road construction workers. 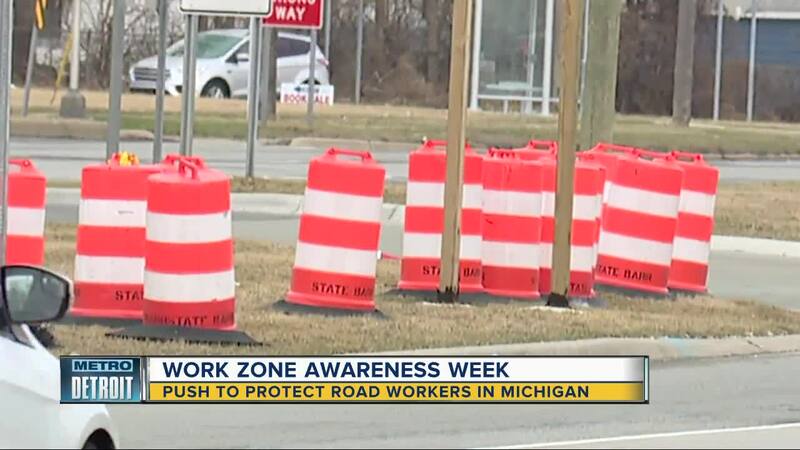 DETROIT (WXYZ) — Some jobs come with inherent dangers, but few seem as obvious as road construction once you stand on a work site and hear vehicles whizzing by at high speeds. That’s just what Washington did recently when he was on a job in the early morning hours. The screech came from a driver on I-96 near the Wyoming Avenue exit. Washington was taking pictures with his iPad of damage when he heard the noise and instinctively jumped — instead of getting hit himself he heard his truck take the hit, the woman who was behind the wheel ended up about 100 feet away from him. Washington ran to the woman to give help. It wasn’t the first time he’d had a close call after 30 years on the job. MDOT works hard to train crews in safety procedures. Washington notes that they’re trained to work with a line of sight toward traffic so it increases reaction time. They go through painstaking effort to cone off work zones, and when possible they’ll strategically place trucks, equipment and concrete barriers whenever possible. Despite all of that, they rely on drivers to be safe — something that isn’t common in the age of distracted driving. They call it a “toward zero death” safety campaign – the end goal is to decrease as many deadly injuries as possible. You don’t have to look too far back to see the impact. In 2018 a construction worker was killed on the job in Detroit when a suspected drunk driver struck and killed David Snell. The Bay City man was working on I-75 near Warren Avenue when he was struck and killed. The work itself is dangerous. Last week Daniel Clark — a local electrician — was struck by a co-worker on a project while working near I-75. With those types of risks on the job, workers stress that anything drivers can do to increase the safety they feel in work zones is appreciated.